The Vaddio EasyTalk USB Audio Bundles System C is intended for medium size conference rooms (20’ x 30’) with typically 2 to 20 participants. A second EasyMic device is added to extend microphone coverage for the larger room applications. 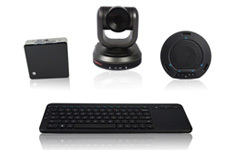 In addition, the EasyTalk USB solution can be paired with the Vaddio HD-USB PTZ Camera to implement a complete AV conferencing solution for the PC or MAC. 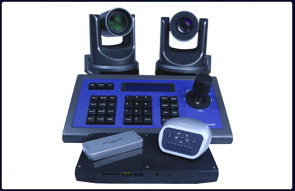 These products are offered in pre-configured room bundles for common conferencing applications or create your own custom solution by purchasing each appliance individually. 1) Power Connector: 5.5mm OD x 2.5mm ID positive center coaxial connector for 18 VDC, 2.75 Amp power supply. The supply also provides power to the EasyMic MicPODs and the EasyMic Ceiling MicPODs. 3) USB: USB Type B-Female connector for interface with Host PC. This connector allows for Streaming audio, to and from, the EasyUSB Mixer/Amp. It emulates a standard USB Audio Class device and eliminates need for customer drivers. 4) RS-232: RJ-45 connector with RS-232 functionality (see appendix for pin-out) .Control port for use with Vaddio WEBBi or third party control systems (AMX and Crestron). This port supports Vaddio ASCII command protocol. It also includes an operational mode for direct connection to Vaddio PTZ cameras for preset execution with One-Touch camera preset button. 5) Speakers: Two amplifier output ports with 2-pos phoenix-type terminals. Each port supports 20W into an 8 ohm loudspeaker load. Class-D amplifier is capable of supporting loads down to 4 ohms. Both Amplifier outputs have the same audio signal (Mono). 6) Line Input & Output: Unbalanced RCA line level input and output port for connection to external A/V devices such as video conferencing codec, external amplifier, or recorder. It supports a nominal level of -10dBU. 7) EasyMic Ports: Two proprietary RJ-45 ports for connecting EasyMic (Pod or Ceiling Array) to the EasyUSB Mixer/Amp. Connection provides power, control, and audio to the EasyMic device over standard CAT-5 cable for up to 100 feet. Echo Cancellers are in the microphones, one per mic element. The EasyMic MicPOD is a proprietary tabletop microphone device for use with the EasyUSB Mixer/Amp. It incorporates three unidirectional microphone elements and three acoustic echo cancellers for premium 360 degree coverage. The EasyMic MicPOD performs the Hands-Free audio processing required for conferencing applications. The pod also includes user interface buttons for typical functions used during an audio conference.